1Most Americans (83%) ages 65 and older say they have grandchildren, according to our nationally representative survey of U.S. adults. Of these grandparents, two-thirds (67%) say they have at least four grandchildren. Among those ages 50 to 64, the share with grandchildren drops to 52%, with about half (47%) of grandparents this age saying they have at least four grandchildren. 2More grandparents are living with a grandchild. About 7 million grandparents lived with a grandchild in 2013, up from 5.8 million grandparents who did so in 2000, according to Census Bureau data. Among these grandparents, a significant share (37%) also serve as their grandchildren’s primary caregiver. 3For most American grandparents, child care is only an occasional responsibility. Our survey on family support in graying societies found that among U.S. grandparents who have helped with child care in the past 12 months, nearly three-in-four (72%) said they did so only occasionally. About one-in-five (22%) said they provided child care regularly. However, grandparents in Germany and Italy are much more likely than American grandparents to provide regular child care for grandchildren: 46% of German grandparents and 39% of Italian grandparents said they provide regular childcare. There are two key factors that could explain why American grandparents are less likely to care for their grandkids: Older people in the U.S. are more likely to be in the labor force than their counterparts in Germany and Italy. Also, older Americans have less financial support from the government than Germans and Italians of the same age. 4Grandparents who live with their grandchildren are more racially and ethnically diverse than the U.S. population overall, according to a Pew Research Center analysis of Census Bureau data. Less than half (48%) of grandparents with grandchildren at home are white, while 75% of Americans overall ages 50 and older are white. 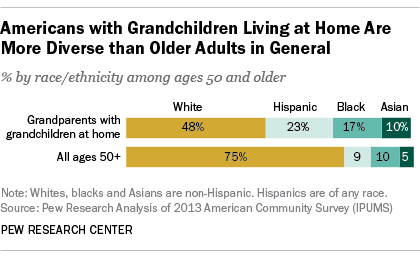 Meanwhile, Hispanics, blacks and Asians make up a larger share of grandparents with grandchildren at home than they do of the 50+ population overall. 5Older Americans say having more time to spend with family is by far the best part about growing old. Among those ages 65 and older, the two most common answers to an open-ended question on the benefits of aging were spending more time with family (28%) and spending time with grandchildren (25%). The next-most popular answer was financial security, cited by just 14% of respondents. On Grandparents Day, will you call, text or write?